Global security and aerospace company Lockheed Martin will invest an initial $13 million over three years to establish a Science Technology Engineering Leadership and Research Laboratory (STELaR Lab). Raydon Gates, Chief Executive, Lockheed Martin Australia New Zealand and Dr. Keoki Jackson, Lockheed Martin’s Chief Technology Officer announce the establishment of STELaR Lab to undertake R&D to solve the technology challenges of the future, and work in the art of the possible. The facility will be situated in the heart of Melbourne’s emerging technology district between University of Melbourne and RMIT, scheduled to open in early 2017. 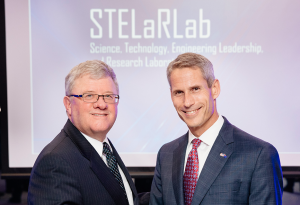 STELaR Lab is the first leading edge multi-disciplinary facility to be established by Lockheed Martin outside of the United States, will constitute Lockheed Martin’s national R&D operations centre for its current research portfolio in Australia, and undertake additional internal R&D programs. The company confirmed the strategic investment in Australia’s future R&D program will create premium jobs for science and technology graduates, with STELaR Lab anticipated to grow to over 20 employees within three years. In an event, Dr. Keoki Jackson, Lockheed Martin’s Chief Technology Officer, announced Melbourne’s growing international reputation for research was a key factor in the consideration of a location for the Laboratory. “The decision to establish a multi-disciplinary R&D facility in Australia was partly based on Lockheed Martin’s own track record of Research & Development success with Australia’s Defence Science and Technology Group and Australian Universities over the last 20 years,” Mr Jackson said. Raydon Gates AO, Chief Executive of Lockheed Martin Australia New Zealand, confirmed the Lab marked a significant step change in Lockheed Martin’s capabilities in Australia, paving the way for deeper collaboration with partners and customers. “Lockheed Martin technologies and best practice capabilities ensure our local partners can meet the challenges and opportunities of an increasingly changing world,” he said. Premier of Victoria Daniel Andrews, who was also present at the event, said the new R&D lab will help Victoria captivate and maintain the best minds so we can continue to be the brains behind Australia’s advanced manufacturing, defence technology and innovation. “This investment is a vote of confidence in our workforce and will help promote Victoria’s innovation and design capabilities around the world,” Mr Andrews said.